Home / Samsung. / Smartphones / Galaxy Note 9 unveiled in New York City: Leaks Details. With Galaxy Note 9’s unveiled in New York City on Thursday, here are some spec details about it. The new leak arrives (via winfuture) with what look like official promo materials for the Galaxy Note 9, including S Pen features, press renders, specs, and price. 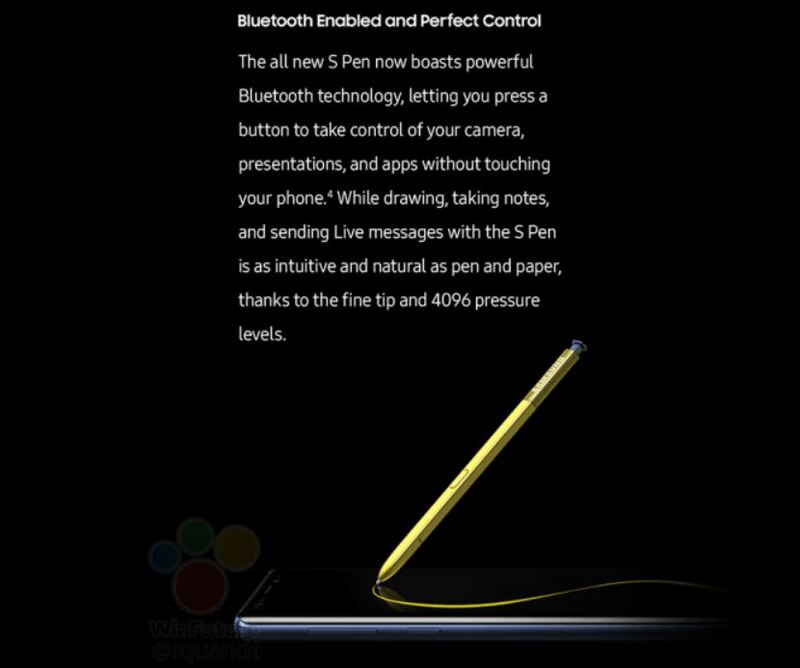 The report also mentions that Screen-Off memos will now match the color of the S-Pen, meaning the yellow S-Pen that ships with the Blue model will draw in bright yellow. 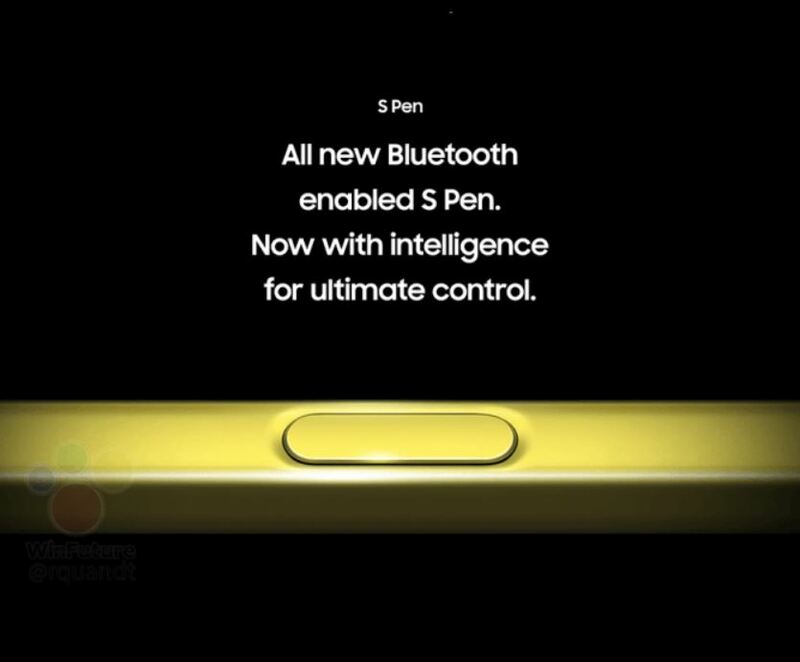 This is something we saw in Samsung’s previously leaked teaser ad. The Galaxy Note 9 is much like the Galaxy Note 8. The device will come with Snapdragon 845 Soc, just like Galaxy S9 series. This time, though, the base model will have 128GB of internal storage. It will come in 6GB and 8GB RAM. The device will have a 6.4-inch AMOLED display. 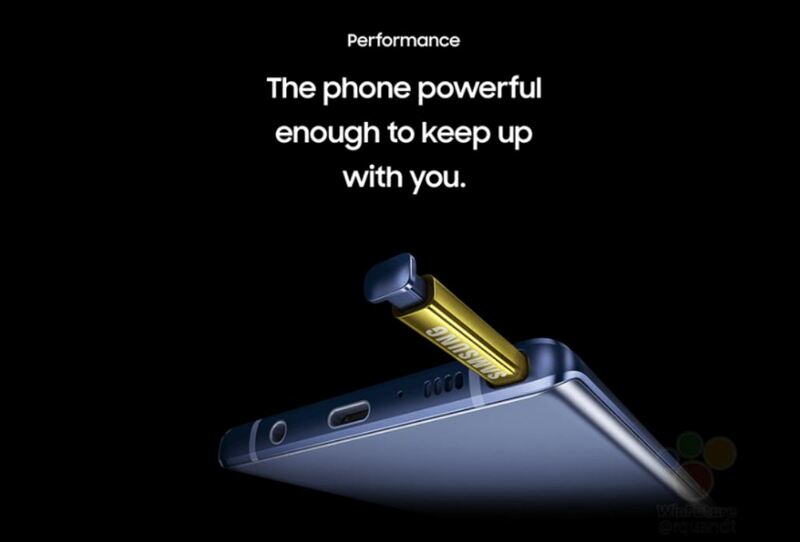 A leaked promo image (below) also describes the Note 9 as a phone “powerful enough to keep up with you.” perhaps suggesting 4,000 mAh battery. 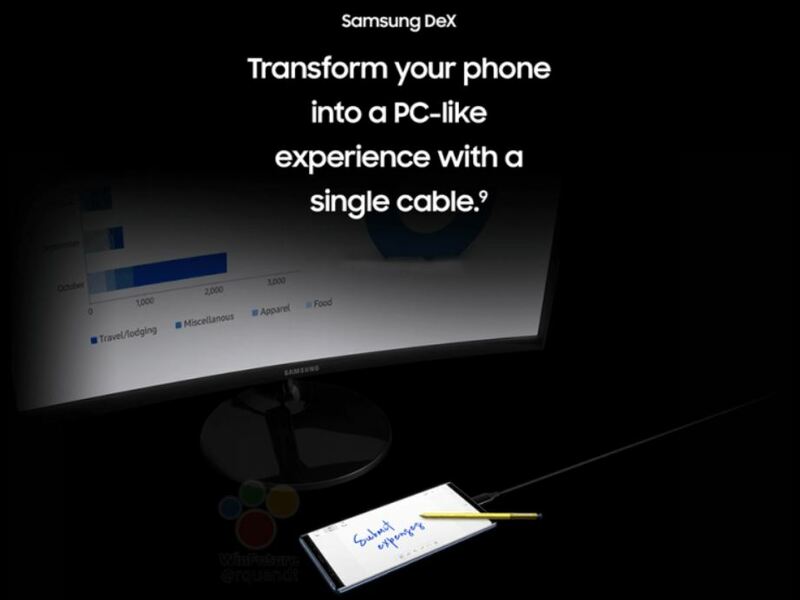 Samsung’s DeX feature won’t require a dock with the Galaxy Note 9, instead being available through a simple USB-C to HDMI cable. 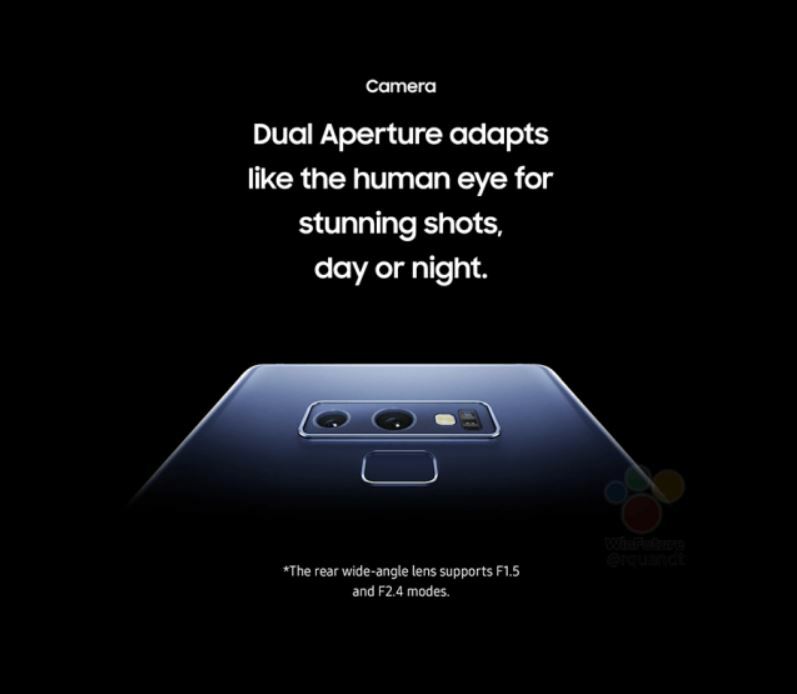 The Galaxy Note 9 will carry a dual-aperture camera, just like the Galaxy S9, camera sensor to switch between f/2.4 and f/1.5 depending on the available light. 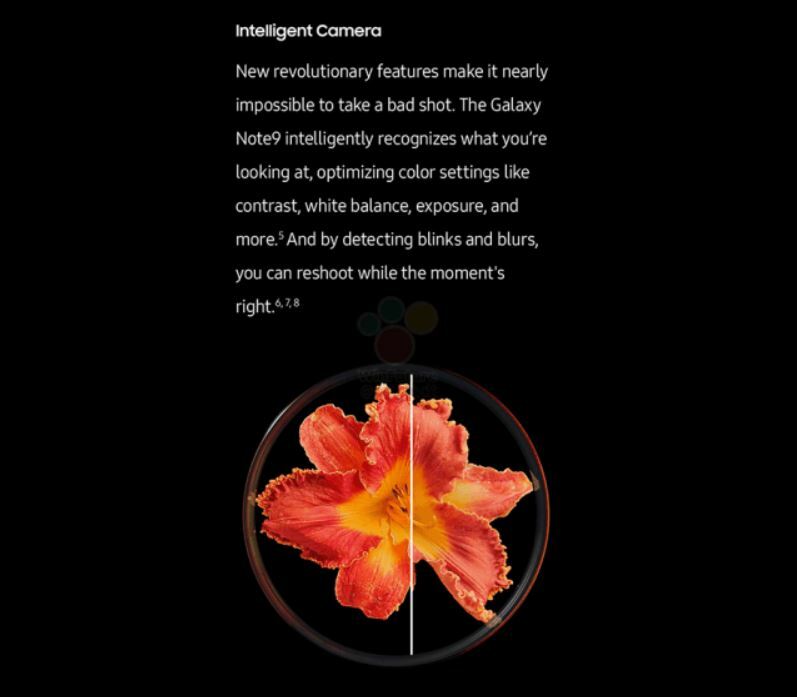 There’s also mention of the Galaxy Note 9’s AI camera features that’ll optimize white balance, detect when someone blinks, and more. 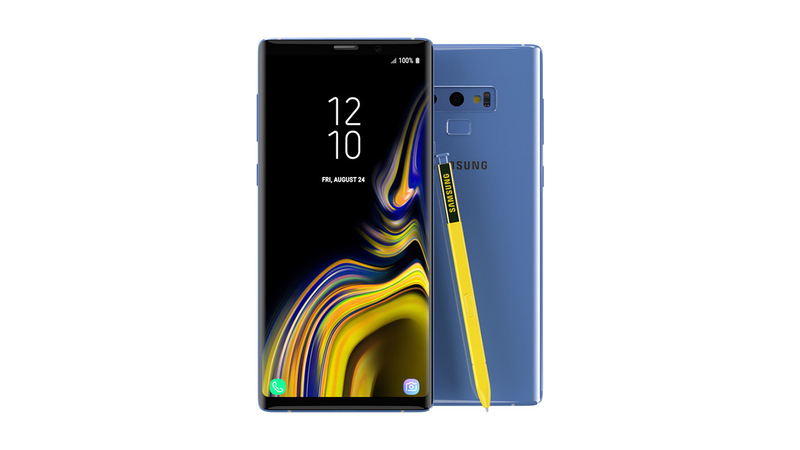 The 128GB/6GB Galaxy Note 9 in the UK will cost 899 pounds while the 512GB/8GB model will sell for 1099 pounds. Converted to USD, that works out to around $1165 and $1424, respectively. The US price will be different. Samsung is announcing the Galaxy Note 9 August 9, and apparently, pre-orders are going to open up shortly after the event.